In the vampire world, I’m small fry—yet how many people in it can boast about having a blog dedicated to them? I can. It’s called Hoggwatch. Hoggwatch screencap. Accessed April 29, 2014. Don’t let the “B.O.S.” [British Occult Society] byline fool you—it was actually written by Sean Manchester, best-known for his involvement in the Highgate Vampire case, which I write about in my blog, Did a Wampyr Walk in Highgate? How do I know Manchester’s its true author? After I posted it on my Facebook group as an example of the way people who write about the Highgate Vampire case are harassed and stalked, Manchester submitted an intellectual property claim against it. I was subsequently suspended from posting to Facebook for three days (Hogg 2013). Manchester is the author of The Highgate Vampire: The Infernal World of the Undead Unearthed at London’s Famous Highgate Cemetery and Environs (British Occult Society, 1985; rev. ed. Gothic Press, 1991), an account of his alleged investigation into an honest-to-goodness Dracula-like vampire in London. He also fancies himself a vampirologist, attested by his book, The Vampire Hunter’s Handbook: A Concise Vampirological Guide (Gothic Press, 1997), yet its contents highlight his true interest: feuds and smear campaigns against his critics and enemies. If the book had been called “Details of my feuds with David Farrant and other occultists” it would have been more relevant. For, that is what this book actually is. At £7.50 you get 96 pages. Out of those 96 pages I reckon that well over half deals with Manchester’s feuds with David Farrant etc. (Gilham 2004). Online, Manchester is no different. His church website even features a page on his former friend and archnemesis, David Farrant. (“Bishop Seán Manchester & David Farrant” n.d.) Yes, his church website. You see, Manchester isn’t just a self-proclaimed vampire hunter, he’s also the bishop of an “autocephalous” British Old Catholic church called Ecclesia Apostolica Jesu Christi; Church of the Holy Grail. Through that vessel and various media, he devotes energies you’d think would be reserved for pastoral duties, into attacking various critics. I’m one of them. The sad thing is, in a way, I used to admire Manchester. I saw him as a modern-day Van Helsing. During the early stages of my vampire interest, I enjoyed reading the Highgate Vampire account in J. Gordon Melton’s The Vampire Book: The Encyclopedia of the Undead (1994, 297–300), among other books. Don’t get me wrong, though: I didn’t actually believe Manchester’s story, but I found it pretty cool. In 2002, I joined his online forum, The Cross & the Stake, an MSN Group which derived its name from the newsletter of his organisation, the Vampire Research Society. I contributed to it regularly, shooting the breeze on all sorts of supernatural topics. Four years later, I was banned under highly dubious circumstances. That ban set off a chain reaction, which I’ll delve into another time. Over the past few years, there has been a rise in the number of people who lie, slander and defame me on the internet (well, me and everyone else who’s famous). This is not completely unexpected; success brings attention, and attention brings haters (especially on the internet). At the beginning, I mostly just ignored the haters, not only because they were idiotic trolls, but because their lies were so ridiculous I didn’t even think I needed to respond to them. That sort of strategy–not even dignifying the preposterous slander with a response–used to work in the 20th century when there were relatively few media outlets, because the trolls didn’t have a way to reach people. The 21st century world is not like that anymore. Now anyone can make their voice heard, no matter how right or wrong they are. And because of linking and Google and anonymous message boards, people can find the writing of kooks. There is no gatekeeper, no barrier for truth, no objective clearinghouse of information and thus no way for someone to find out the validity of the varying sources. Because of this, the response strategy to negative gossip has to change: Instead of ignoring them, I think the best thing to do is bring the lies to light, then give the necessary information to answer them and dismiss them. The best example of this is what President Obama did during the election. Obama’s campaign found that lies and smears can only exist where there is a vacuum of information about the real truth, and showed that if you have nothing to hide and are completely transparent with the truth, it will kill the power of lies and rumor. Manchester’s intent with Hoggwatch is clearly to draw negative attention to me; to cast me in a bad light. It’s little different from smear campaigns run by politicians. Indeed, Manchester once ran for election under the pseudonym “George Byron” in 1982 (Manchester 1985, ch. 9). Writing under a pseudonym, of course, also helps preserve his own manufactured image as a righteous Christian bishop, despite failing to embody the role on multiple levels—not even counting his penchant for Nazism, as recounted by his former friend, Kevin Chesham (Chesham n.d.). The second purpose of my rebuttals is to serve as a public service announcement for those who critique Manchester’s case: prepare to be on the receiving end of some nasty and incredibly malicious behaviour. A perfect example is encapsulated in David Farrant’s Pact with the Devil (British Psychic and Occult Society, 2010), which details Manchester’s harassment of Catherine Fearnley, his former associate. I have also written a PSA elsewhere (Hogg 2010). Forewarned is forearmed. Anthony Hogg is an unemployed man, born in the 1980s, and a resident of Melbourne, Victoria, Australia, who has been stalking and harassing anyone sympathetic or somehow connected to the author and exorcist Bishop Seán Manchester, including the Bishop himself, for a decade. First off, I actually do have a job, but for obvious reasons (namely, the existence of a blog like Hoggwatch, in the first place), I’m not gonna say what it is. Second, Manchester’s third person reference, “stalking and harassing anyone sympathetic or somehow connected to the author and exorcist Bishop Seán Manchester” is nonsensical. It’s true I’ll sometimes turn up on blogs and forums dedicated to discussing the case, but why wouldn’t I? I write about it. It interests me. Hogg compulsively posts abusive and derogatory statements and allegations about this person on the internet every day and into the night. I don’t discuss Manchester that much. My own blogs and Facebook groups will attest to that. 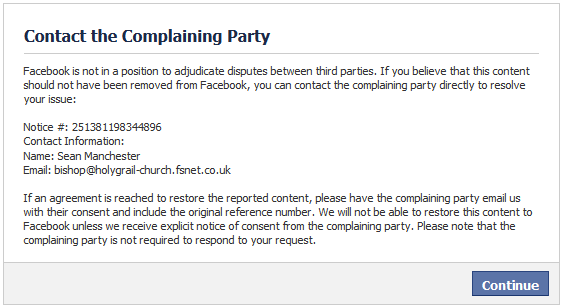 But more importantly what “abusive and derogatory statements” have I been posting? It’s true I have exposed Manchester as a flagrant plagiarist, exposed him framing a dead guy in a publicity stunt involving Nazis, not to mention unravelling the identity of the Highgate Vampire’s “victim”, among many, many, many of his dodgy claims. But that’s not “abusive or derogatory”—that’s just stating the facts and discussing his claims in context with critiquing them. His theme is always the same. He appears to many outsiders as a totally manic individual who has an unhealthy obsession with Bishop Seán Manchester and events surrounding a supernatural case about which the Bishop wrote a very succesful book in the previous century. The case itself occurred on the other side of the world to where Hogg lives and long before he was born. Who are these “many outsiders,” I wonder? I’ve yet to hear from them. And who’s the “manic” one? Manchester refers to himself, in third person, two times in that portion alone. Perhaps Manchester’s obsessed with himself. Now, it’s true did occur on the “other side of the world” from me, but what’s the relevance of that? I write about vampires. Rest assured, there are none in my neck of the woods, either. Should writers only write about things that happen in their own country or city? That seems very limiting. As to when I was born, by that logic, does that mean people shouldn’t study or write about things born before their time? I guess we don’t need archaeology any more: they weren’t born during the eras they investigate; their findings are irrelevant. Bishop Seán Manchester was a public figure throughout the latter half of the twentieth century, but nowadays considers himself very much a private individual. He obviously has his critics — what ardent believer does not? — but there is a difference between a critic and a troll. Manchester might consider himself a “private individual”, but his legacy—through books, newspaper and magazine articles, interviews, radio spots, etc.—isn’t. It’s not like I’m turning up at his house, peering over the fence: the stuff I discuss is publicly available information; quite a lot of it he’s publicly posted, himself. It’s nice that Manchester acknowledges his critics, but the “ardent believer” bit infers they critique him because of his belief. Rest assured, there are many other reasons to critique him, ranging from stealing people’s contents, ideas, harassing people, stalking them, and so on. Personally speaking, I don’t begrudge Manchester’s belief in vampires (though I’d be surprised if he really does believe in them, considering his story is such an obvious Dracula pastiche), my beef’s with him presenting his account as a true story, not to mention the way he handles critics in the first place. a person who sows discord on the Internet by starting arguments or upsetting people, by posting inflammatory, extraneous, or off-topic messages in an online community (such as a forum, chat room, or blog) with the deliberate intent of provoking readers into an emotional response or of otherwise disrupting normal on-topic discussion. I’ll admit it, sometimes I say smart-assed things and poke a little. Why? Because you gotta have a sense of humour about this, or it does your head in. It’s true, things can get heated, too. They lapse into arguments. Flame wars happen, the usual. Despite that, I always try to focus on the topic at hand. So, no, I’m not a troll. When I discuss the case, I stick to the facts as much as possible. I actually prefer civil discourse, indeed, I’ve even emailed Manchester a few times to hash things out with him. I once even tried getting him and David Farrant to make amends (and I still wish they would). Unfortunately, he’s not really game for polite discussion as Hoggwatch, itself, attests. My main interest in the case is in unravelling something that’s a complex narrative in its own right. One day, I may even write a book about it. In the meantime, I keep up with the discussions, collect resources and encourage varying viewpoints on the case. That’s why I get so excited when balanced writings on the case emerge. They’re far and few between, but also show that something positive can emerge from studying the case. Anthony Hogg claims “the photo accompanying the [Hoggwatch] blog [shown above] is thankfully incorrect,” ie chosen to represent him at random and therefore false. This, like much else of what he says, is a lie. The photograph correctly identifying him was found on his Microsoft messenger profile where he put it. Those receiving messages from the same Anthony Hogg who stalks Bishop Seán Manchester saw it. Ok, so I lied. Yes, it’s me. You got me there, Sean! Why did I lie? Because I wanted to protect my identity. Now why would I want to protect my identity? Oh, of course: because you keep stalking me and trying to post my personal info online. Now, I know you’ve had your mug plastered everywhere, but believe it or not, some of us do still want to maintain a sense of privacy about ourselves, especially in the real world. I’ve got a mate, who I’ve known since high school, who wasn’t even aware of my blogs until he Googled me one day. He finds the whole thing quite amusing and sometimes asks about my latest adventures with you. But imagine someone who doesn’t know me personally, stumbling across a blog about me referring to me as a “troll,” “stalker,” etc. What impression would they have? Speaking of which, do you know why I even use my real name at all? Because you insisted on publicly revealing it. I was content posting under my usernames, “The Inquistive One” and “The Overseer” (but I at least didn’t pretend they were separate people, as per your “B.O.S.” third person routine). If you hadn’t insisted on that, who knows, maybe I’d even still be writing under a pen name today. But it got to the point where I figured, “Bugger it. If my real name’s out there now, I might as well start using it.” If your intention was to intimidate me into silence, it backfired, my friend. Now, does my lie mean I lie about everything else? No. After all, when I discuss the case, I cite my sources, link to them or post screencaps. People can double-check the info for themselves. Hoggwatch, of course, doesn’t give them that courtesy; it features a variety of quotes from various sources with no context, no links. And why would it? It’s meant to smear me, after all. Hogg’s principal blog was disabled by WordPress for repeated offences that included defamation and illegally infringing Bishop Seán Manchester’s lawfully owned copyright material. Such violations occured on multiple occasions over a number of years. He has now turned to other services to continue his trolling. 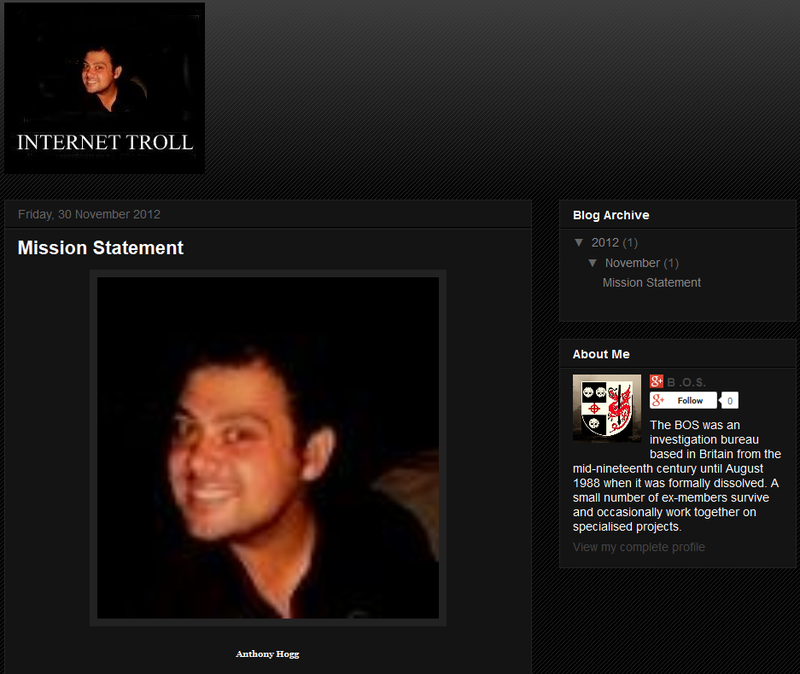 On one of his alternate blogs (http://www.parafort.com/dawwih/) he uploaded most of what was on his suspended WordPress blog, minus the infringed images which he could not access. Not quite true. WordPress suspended my blog—also called Did a Wampyr Walk in Highgate?—due to the repeated DMCA takedown notices Manchester issued against me, not because of “defamation”. DMCA (Digital Millennium Copyright Act) takedown notices are issued to bloggers, website owners, yadda yadda, by a claimant insisting that someone is violating their precious copyright. Various web hosts handle the issues in different ways. In the Facebook suspension I mentioned earlier, they gave me two options: ask the claimant (Manchester) to withdraw his claim to re-host the material (which was a link to Hoggwatch, ironically) or get a lawyer. Screencap revealing Manchester as the author of Hoggwatch. November 25, 2013. I wasn’t even allowed a right of reply, they just removed the content and suspended me. For the record, I did contact Manchester, but he didn’t respond to my e-mail. Big surprise. WordPress, on the other hand, had a much more considerate approach: I could contest the claim with my own counter-notice, saying I had a right to post the material (which I thought I did, under “Fair Use,” which allows writers to use copyrighted material if it’s in context with criticism and a few other guidelines) if I supplied the claimant with my personal information, i.e. home address, phone number, etc. As you can imagine, I was quite reluctant to do that. I even offered to give it to them, if it’d avoid handing it to him. Alas, they didn’t go for it and were forced to shut down my blog. Not their fault, they have to stick to company policy. Now, you might be wondering, how was I able to rehost my blog if they shut it down? Well, as it happens, WordPress were quite sympathetic to my plight. They re-opened my blog for a brief period, so I could save it as an .xml file and rehost it elsewhere: Trystan Swale, the guy I did a podcast with last year, offered his site. In terms of accessing the images, I could, because I’d saved them. But naturally, I was reluctant to rehost them again. This replacement blog lasted a matter of days due to Hogg and Swale refusing to remove two stolen images of Bishop Manchester (taken long before either of them were born) and being unable to prove, as they had falsely claimed, that the pictures were their own copyright. The other was a photo of Manchester performing a Satanic ritual, which features in Jean Paul-Bourre’s Messes Rouges et Romantisme Noir (Alain Lefeuvre, 1980). Yep, Manchester used to dabble in Satanism, too. I don’t think Trystan was claiming to own their copyright, I suspect he made a case for fair use, too—one that also fell on deaf ears. The images were in the blog’s banner. Trystan Swale and Anthony Hogg somehow feel they have the right to steal photographs exclusively owned by Bishop Seán Manchester and illegally publish them to incite hatred using false and derogatory attributions. And if the Bishop dares to recover his own property by issuing a legal take-down notice these two malcontents consider it to be “harassment.” Such is the behaviour of mindless trolls who are obsessed with someone they do not know, have never met and have never spoken to. I don’t think I have that right, like I said, I used other images in context with “Fair Use.” I think the pictures, in this case, were used a little cheekily, sure. But “illegally publish[ing] them to incite hatred using false and derogatory attributions”? No. How could there have been anything false about them, anyway? They were of Manchester; one from an article he wrote, the other from a study in black magic he participated in. I don’t know Manchester personally, but I have spoken to him, as e-mail correspondence will attest. If Manchester would grant me permission, I’d happily post them on my blog. For the record, it’s not the claims, themselves, I consider to be harassment, but his use of the DMCA takedown notice process in order to stifle criticism. Not to mention their blatant hypocrisy: as noted, Manchester frequently plagiarises other people’s work, himself. There’s an addendum to this story, too: after that blog went down, Trystan rehosted my blog on another website—which was also taken down through Manchester’s repeated DMCA takedown notices against it, something Trystan discussed here. But while all that hullaballoo was going on, WordPress sypaththised with my plight, again, pointing me to an article by Paul Sieminski discussing the ways people abuse DMCA claims. Does it actually sound like they were actually against my use of the images? Thought not. But what were the original images in question? The one that caused my original WordPress blog to be terminated? As discussed here, they were images proving that his Highgate Vampire wasn’t a Jack the Ripper suspect (yes, this thing gets crazy sometimes) by comparing the guy with Manchester’s photo of the vampire and also screencaps revealing how Manchester had substantially revised his blog entry after my initial findings—to rip my own findings off, without acknowledging me as the source. Censorship works in weird and wonderful ways, folks. It is curious and somewhat telling that rather than use a likeness of himself, Anthony Hogg chooses an American actor as his representational image on Facebook. We could almost be forgiven for thinking he was ashamed of who he really is, ie an Australian young man of mixed race who was born at least ten years after Brad Pitt, the icon he misleadingly offers to Facebook users as himself. I find it more curious that a supposedly Christian bishop would create a nasty, disturbed blog like Hoggwatch; refer to himself in the third person, repeatedly; use a shield as his picture,all the while masquerading as “B.O.S.” (British Occult Society)—an organisation he “dissolved on 8 August 1988“, but I guess that’s just me. Yes, I use a picture of Brad Pitt on my Facebook page, specifically a picture of him in his role as Lt. Aldo Raine in Inglourious Basterds (2009)—one of my favourite movies, by the way. Does he honestly think I’m trying to get people to think I’m one of the most famous actors in the world? Surely he can’t be that daft. So why do I use that picture? Two reasons, actually. One, to obscure my identity. Two, what role does Pitt play in the movie? And what is my “number one fan” here? I’ll leave you to work that out. Suffice it to say, it’s a sly poke that’s seemingly gone over Herr Manchester’s head. Indeed, until recently, Hoggwatch was no longer in existence. After I wrote my exposés on Manchester’s role as its author, it mysteriously disappeared. It has only recently been reactivated, no doubt in the wake of my rebuttals to Manchester’s comments on Swale’s article. Indeed, Hoggwatch now incorporates a chunk of (uncited) text from Trystan’s other article, “More Fruit for the Cake” (April 26, 2014) on his own blog. Hoggwatch was initially set up to monitor this troll’s libellous and malicious allegations about Bishop Seán Manchester in order to amass evidence with view to aiding an eventual prosecution. It came to be suspected by a growing number of people, that Hogg might possibly be suffering from Asperger Syndrome which is characterised by qualitative impairment in social interaction, by stereotyped and restricted patterns of behaviour, activities and interests; and by an intense preoccupation with a narrow subject, plus one-sided verbosity. Consequently, Bishop Manchester has requested that Hogg henceforward be ignored and not be provided with any stimuli which might further trigger him. Hoggwatch, therefore, has become redundant and will not be providing any updates. Wow, just… wow. Where do I begin? Second who are the “growing number of people” suspecting I suffer from Asperger Syndrome? None are mentioned. If anything, it serves as a monument to his hypocrisy and sociopathic tendencies. After all, the very same blog has been updated (it features commentary from Manchester from only a few days ago) and that Manchester’s unauthorised “Asperger Syndrome” diagnosis has been in place from the time it was originally shut down. Now let this post be a warning to you: critique Manchester’s claims, cast doubt on his Count Highgate Vampula, talk about his aliases, his history of harassment and stalking, any of that—and you could end up with a Hoggwatch of your very own. This is Anthony “Not a Troll” Hogg, signing off. “Bishop Seán Manchester & David Farrant.” n.d. Holy Grail. Accessed April 29, 2014. http://www.holygrail-church.fsnet.co.uk/FarrantFacts.htm. Chesham, Kevin. n.d. “Kevin Chesham – The Autobiography – First Extract.” Kevin Chesham – Triathlete. Accessed April 29, 2014. http://kevchesham.blogspot.co.uk/p/kevin-chesham-autobiography-first.html. Gilham, P. 2014. “Does Not Do What It Says on the Tin…” Review of The Vampire Hunter’s Handbook: A Concise Vampirological Guide, by Sean Manchester. Amazon, July 18. Accessed April 29, 2014. http://www.amazon.co.uk/review/R20Y8QWQABL5DG/ref=cm_cr_rdp_perm?ie=UTF8&ASIN=1872486029. Hogg, Anthony. 2010. “Public Service Announcement.” Diary of an Amateur Vampirologist, February 8. http://doaav.blogspot.com.au/2010/02/public-service-announcement.html. Hogg, Anthony. 2013. “Suspended from Posting to Facebook for Three Days.” Did a Wampyr Walk in Highgate?, November 26, 2013. http://dawwih.blogspot.com.au/2013/11/suspended-from-posting-to-facebook-for.html. Max, Tucker. 2014. “Frequently Asked Questions.” TuckerMax.com. Accessed April 29, 2014. http://www.tuckermax.com/about/faq/. Manchester, Sean [B.O.S.]. 2012. “Mission Statement.” Hoggwatch, November 30, 2012. http://hoggwatch.blogspot.co.uk/2012/11/mission-statement.html. Anthony I think writing a piece like this was long overdue! I believe in transparency and honesty. Lay all your cards on the table and people will see the truth for what it is. It is unfortunate that certain people abuse systems that were put in place to protect people in this day and age, and instead issue warrantless DMCA claims to intimidate people into silence. I think people see through Sean Manchester’s flagrant online activities, after all he only seems to copy and paste the same crazy accusations repeatedly. Perhaps he needs a new hobby? We share values then, Erin! And yes, people certainly do take advantage, but webhosts have their hands tied to a degree due to the nature of the law. Naturally, people like Sean Manchester take advantage of this, but fortunately, WordPress has been very helpful.